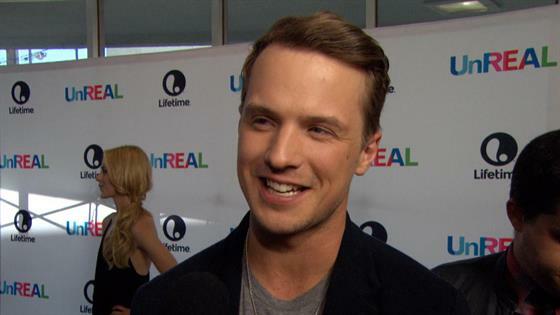 When Freddie Stroma heads back to UnREAL in tonight's episode, he might look a bit different than he did last year thanks to some new facial hair and shaggy haircut. But don't worry, Stroma's Adam is still the character you know and love. "He's very attractive still. He takes his shirt off. All the things that everyone wants to see," star Shiri Appleby jokes to E! News. Adam's return comes at a pivotal moment for Rachel, who is still recovering from the trauma of being assaulted by her ex, Jeremy (Josh Kelly). "[Rachel and Adam's relationship] was unresolved at the end of season one, so he's going to come back and stir things up," Stroma tells E! News. "She needs someone that can understand her; someone who's not going to bore her, but also not let her destroy herself. I think Adam has a good heart, in the end." Appleby also dished to E! News about what working on UnREAL has taught her about reality shows. "I can now watch them and actually see the manipulation. I grew up in Hollywood, so I knew that they weren't real," she says. "But what has changed working on this show is [realizing] how people can be so manipulative. I am a very honest, straightforward person, I tell the truth, so realizing that people can be so manipulative makes me look at the world with different eyes. Now I'm able to see when someone is being honest or being untruthful much more clearly." Something also manipulative? Rachel's messed-up relationship with Quinn. Did "UnREAL" Set Out to Expose Reality Dating Shows? "I think there is a genuine affection between them," Appleby says. "I think that there is this relationship—it's mother-daughter, mentor-protégé, sisters, friends, it's all of that, and there's also the competition. I think their relationship makes both of them stronger. And also, neither one of them has anything else. They don't have boyfriends, they don't have husbands, they don't have friends. We never see them leave their work. This show and their relationship is all these women have. … [it] creates great drama, but it's not healthy." Press play on the videos in this post for more about Rachel's love life, Bachelor drama and more. UnREAL airs Mondays at 10 p.m. on Lifetime.